Looks like Japan has eliminated the need for lunchboxes. Why put your food in a box when you can carry it on your head? 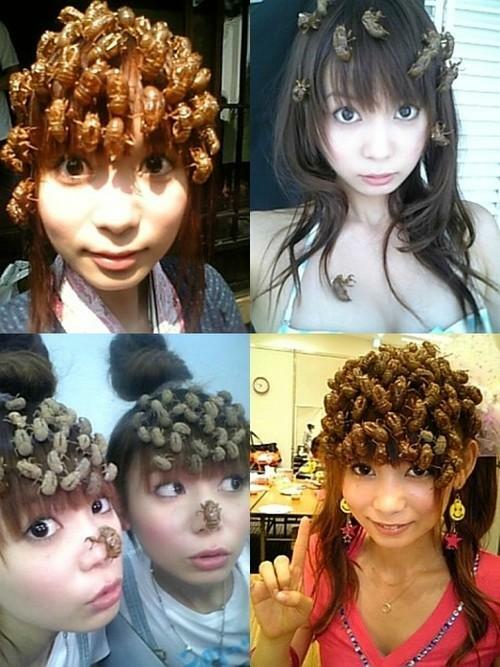 I'm pretty sure someone just put bugs on photos of girls. I don't think this is a new fashion craze. It's a fetish for some men. oh God... Nakagawa Shoko, i don't know what to do with you. you're such a tard. Eeeeeewww! Oh lord, that's disgusting. Ugh, this is going to be in my nightmares for weeks. Whoever said the girl in the top right is hot... they're all the same girl -- Nakagawa Shoko.. and i'm pretty sure those are fake. Or atleast i hope they are. Regardless, she is still hot. They're just the bug skins. She is Shoko Nakagawa. Those photos are not fake. pretty sure the bottom left isn't twins but a mirror reflection......wtf!!!!!!! Well at least she's not trying to eat her cat. At least she is not eating her cat, reporting other animal abusers, and selling ugly clothes made of fur. At least she is not donating blood after taking funny beauty suppliment shots. At least she is not buying fake Free! product after getting the becoming the "Anti Piracy Representative" in Nov. 2013. Oh and she also likes to "cover" every single Anime song, claiming them as her own, and goes to every convention around the world? I mean why isn't she gone already. ewwwww gross!!! I mean I know she want to be cute and stuff but not like this!!!!! !